The CDFI Fund is one of the Federal government's best market-based strategies for leveraging private dollars. CDFIs leverage $12 of private capital for every $1 of public investment. Investing in CDFIs generates billions of dollars annually in the form of loans to create jobs and grow businesses, build homes, increase job mobility, expand access to affordable healthcare and childcare, and create financial capability to expand consumer purchasing power. Inclusiv was instrumental in establishing the CDFI Fund in 1994, is a permanent member of the national CDFI Coalition and is the CDFI and community finance authority for the credit union industry. Our member CDCUs represent over 7 million members in low-income communities across the US, representing the majority of all CDFI-certified credit unions. 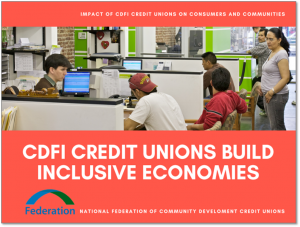 Click here to read impact stories from Inclusiv member CDFI credit unions. The CDFI Fund is a unique source of capital for community development credit unions. CDFI grants can fuel growth in membership, deposits and loans in communities that are eager to join the movement toward cooperative finance. Through the end of 2016, the CDFI Fund has deployed more than $2 billion to encourage the growth of community development finance, including $252 million in financial and technical assistance for CDFI-certified credit unions. Today, CDFI Certification is an essential credential for credit unions that seek a larger role in the development of their communities. In addition to representing CDCUs' interest through advocacy with the CDFI Fund, Inclusiv is also an extensive resource for credit unions interested in learning more about CDFI-certification and offers expert certification and grant writing consulting services. Let your voice be heard. Tell us about a CDFI policy concern or opportunity that affects your credit union. Contact us at: advocacy@inclusiv.org.